Cross Academy is an elite boarding school with two separate, isolated classes: the Day Class and the Night Class. On the surface, Yuuki Cross and Zero Kiryuu are prefects of the academy, and attempt to keep order between the students as classes rotate in the evenings. As the Night Class is full of utterly gorgeous elites, this can sometimes prove to be a bit difficult. It is completely necessary, however, as those "elites" are actually vampires. Yuuki and Zero act as guardians, protecting the secrets of the Night Class and the safety of their ignorant morning counterparts. 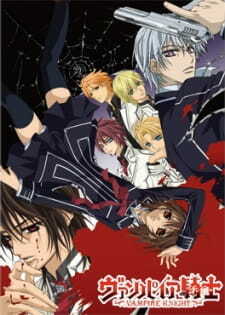 Vampire Knight was released by Manga Entertainment in the UK and by Madman Entertainment in Australia. Vampire Knight is available for streaming on Hulu and Netflix. Additionally, the anime has been adapted into drama CDs, live-action musicals, dating simulators and art books. Some aspects of the setup I liked, like the school divided into day class human students and night class vampire students. I would have loved the human heroine who patrols the grounds and night, making sure the vampires are in line, except...Yuki was TOTALLY lame. Episode after episode was her chasing after Zero, stupidly getting herself into danger, being saved by a male lead, and then feeling guilty. Really weak story, with few redeeming features. The characters didn't grow, events didn't build up into a climax, and the resolution was contrived and lukewarn. It was very much one of those animes annoyingly full of longing, melodramatic gazes and characters saying each others' names in quiet, tortured voices. The art was all right. Yuki was cute, Zero was handsome, and Kaname was gorgeous. The other vampires were pretty lame though, just a bunch of generic bishounen who were totally loyal to Kaname cuz the mangaka said so. I found Yuki's absolutely massive eyes irritating. I've seen a lot of anime by now so I'm used to the huge eyes, but hers actually distracted me at times, maybe because the story had so little pull. Good soundtrack. Lots of classical, which I enjoyed, and I like both the intro and ending songs. The characters are what I disliked the most, especially Yuki. She was an extremely boring protagonist. She carried around a cool-looking staff that seemed to have magical properties, but never once used it well. Usually, she'd just bring it out only to drop it when someone said something upsetting or when she tripped. She was then promptly rescued by Kaname or Zero. Maybe the next season will explain why she is in the middle of all of this, but I think season 1 should give the heroine SOME value. Sure, she was very generous with Zero, but I hate shoujo heroines who only stand out because they're SO good at being martyrs. As for the other characters, they weren't much better. Zero spent most of his time wanting to die. Kaname constantly rescued Yuki, yet never explained her importance to him. A little mystery is good, but too much "she's so precious to me but I won't say why" gets boring and annoying. The "villain" only appeared at the very, very end, and I found their behavior inconsistent and what happened to them way too abrupt and anticlimactic. I don't have high standards. I might've adored this show, if Yuki hadn't been such a weakling. What I usually enjoy in anime shows is watching the protagonist learn and grow. It's okay if the protagonist starts out ordinary or weak or with a massive crush, so long as they become stronger. Yuki really didn't, though. Kaname kept protecting her without explaining anything. Zero usually pushed her away and also refused to share things. She had a big heart, but I like heroines who're genuinely strong, not just good at sacrificing themselves. Sorry, but anyone can say, "Bite me." Maybe this is a good show for teenage girls, but I think anyone who just finished Ouran Host Club or Hana Yori Dango or other such shows will be disappointed by the heroine. Most shoujo is so entertaining because the heroines are so intelligent, or plucky, or independent. Yuki was none of those things. Of course, fangirls who just want to see a cute big-eyed girl get bitten by various bishounen will still love it. If you think that shojo series are all flowery, romantic (comedies) and cheerful, you're quite wrong, and Vampire Knight will prove that more than anything else. Keywords for VK are drama, emotional struggles and tragic pasts. Throw in a dash of vampire, and there you have Vampire Knight in all its glory. The story revolves around the students of the Cross Academy, which is divided into the Day Class for humans, and the Night Class for Vampires. The main characters, Zero and Yuki, both have very sad pasts; Zero had his family killed by a vampire, and Yuki's first memory was a vampire attacking her. These pasts, which are revealed fairly early in the series, make a good base for their relationship and their emotional struggles. During the course of the story, the characters face one event/experience after another, which makes room for emotional struggles, lots of character development and, of course, some romance (hey, this is a shojo series after all), though the latter is overshadowed by the other stuff. The artwork is both standard shojo and something else at the same time. We have the pretty bishonen boys in place, complete with all the fallen-head-over-heels girls, and there's also the standard shojo eyes; large, with pupils that are almost larger than the actual eyes. But since the series has a darker, sadder tone to it, there's no lack on that end either. The coloring is often very dark, and the occasional lighting effect helps on this aspect of the series. The soundtrack is good, with sad pieces helping the sad mood, and overall good quality. There's nothing spectacular about the soundtrack though, and while the OP theme is very good, the ED theme isn't very cool, though it fits with the dark mood of the series. Voice acting is perfect; the moods are portrayed very well and there's an overall good quality. One of the things I love about this series is the characters. I mean, I really love them. They're very deep, with their pasts and emotional struggles. Off course, there's superficial characters as well, but they're mostly supporting characters; the main characters are mostly deep and they have a lot of character development for such a short series. Their relationships with eachother are very deep too, and a pleasure to watch. Overall, I enjoyed the series very much; this is a candidate for the best Spring 2008 anime. It's a bit open at the end, but I just read that there's a second season coming in October, so I'll accept that, and look forward to it. If you like pretty anime vampire boys, this might be right up your street. However, if you like something with a decent plot as well as the associated carnage and animalistic nature that vampires usually have, this will likely leave you somewhat disappointed (and that's me being rather kind..) and wishing it had delivered more for the time you put in. I began watching this on a friend's giddy recommendation and was intrigued somewhat by the first few episodes; although, all the way through near enough, it stayed at the same steady pace of mild intrigue and a general niggling wonder as to when the hell the plot was going to kick in so that the story had some sort of point to it aside from a glorified love triangle. The plot itself, somewhere beneath the anime itself, has a lot of potential. The on-screen variation just doesn't seem to deliver. The characters, despite my 'fangirl-esque' fondness of a fair few of them, aren't particularly well mapped out and a lot of the character basis is shrouded in mystery, although not really in the right way - there are far too many vague bits and not enough explanation when it comes to motive and persona as well as situation. In fact, most of the characters seem not only 2D, but slight variations of the same 2D character. Also, most of the vampires you encounter in this series are rather fluffy aside from the pointy fangs, and the supporting cast are, to a fair extent, pretty forgettable. Visually, it was somewhat pleasing, although a lot of time seems to have been wasted on trivial matters while the potentially good bits have been glossed over or given a moment or two of screen time when they should have had a scene, or at the very least, *more* screen time. Overall, I'd say this series is probably worth a watch if you're just looking for an easy vampire related anime fix, but after spending a good few hours ploughing through this series, I am left wondering if I want to bother at all with its counterpart; leaning heavily towards the 'No' vote. Vampire Knight is the 13-episode anime adaptation of the famous manga by renowned manga-ka Matsuri Hino. I have not read a single page of the manga, but many say the art of the manga was a lot better than in the anime. Perhaps it is. I do think that the art and animation aren't exactly that good. There are quite some distortions in the face of the characters. Some viewers commented that the manga was just too &lsquo;sketchy&rsquo; for the art to be animated. Then again, it wasn&rsquo;t at all that bad. I give the art and animation a 7.